Going to a spa is a bit like staying at a hotel. First, there’s the check-in desk, where you can ask questions on the way in and air grievances on the way out. Next, there’s the lovely stuff on tap element – iced water, many a fluffy towel, occasionally a fig or a peach to chomp on. 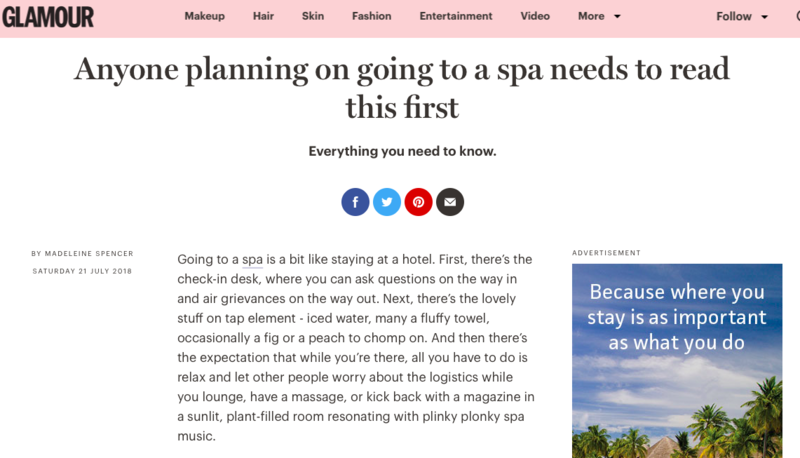 And then there’s the expectation that while you’re there, all you have to do is relax and let other people worry about the logistics while you lounge, have a massage, or kick back with a magazine in a sunlit, plant-filled room resonating with plinky plonky spa music. But there are two big differences between a hotel and spa that mean you might need a little guidance: 1) You’re not in the spa alone – other people will be there and that can sometimes make things a little trickier; 2) In all likelihood you’ll be there for a treatment, which means someone will touch you. Both these things are sources of consternation, including, but not limited to, what to wear (or not wear), whether to shave, and how to navigate an awkward conversation when you really just want to zen out. As seasoned spa-goers, we’ve answered all your most pressing questions about going to a spa for the very first time – and narrowed down treatments that might require a little extra thought. Skip booze and drink water (but not too much). Being tipsy at a spa is grim – if you become louder, the fellow spa guests will be annoyed, if you become sleepy, you’re likely to miss half the treatment. Plus, the spa in its essence is a salubrious place, an opportunity to rehydrate. But don’t hit the water too hard before a treatment – there’s nothing more annoying than having to halt a massage so that you can dash down a corridor scantily-clad in search of a loo. Do you need to shave before a spa? If you feel more comfortable when smoothly-shaved, by all means go ahead – but nobody giving you a body treatment will bat an eyelid if you’re sporting some forestry because a) they’ll have seen it all before and b) it doesn’t make the blindest bit of difference to your treatment, the administering of which is the job that they’ll be focussed on. (N.B. If you are going to shave, don’t do it right before you go to the spa as some treatments like scrubs might amp up redness left behind by shaving). Pack a fresh pair of both to wear on your way out. As for whether you keep them on during a treatment, definitely ditch the socks, but expect to *maybe* keep your knickers on. The best way to go about this one is to don the dressing gown you’re given over your pants, then if the therapist tells you it’s a better idea to wear either none of the paper version they provide, make the switch (and stuff yours in the dressing gown pocket so that you don’t forget them). If you’d prefer to keep your pants and/or bra on, just flag that to the therapist – their job is to make you feel comfortable, so don’t worry about asking. This is one of the most delightful things about taking yourself out of the fray and checking into a spa. By all means exchange niceties before your treatment, but once you’re on that bed, it’s entirely up to you if you want to completely zone out or carry on chatting. This goes for in communal areas, too – nobody is expecting you to talk to them about the weather. If you’re there with someone else and want to have a gossip, do it soto voce and away from other guests who probably are relishing the quiet down time. Also, turn your phone off, or at the very least on silent. If you’ve ever been to an Austrian sauna, you’ll know that wearing clothes in them is strictly verboten. But in the UK, it’s often the case that you’re expected to go in a swimming costume or bikini. To be on the safe side, pack yours, then check the sign before you go in. Most spas will have dressing gowns, slippers and many towels on offer throughout your time there. If you find that they’ve assigned you a dressing gown or slippers that are too big or small, ask for a different size – they’ll usually have several options available. You can also expect most spas to have hairdryers and some basic things like deodorant, but pack anything you can’t live without in case they don’t. If you’re having a bikini wax, some therapists will ask you to remove your pants, others will just position the ones you’re wearing so that they can get to the bits of hair you want taken off. As always, you can choose to do whatever makes you feel comfortable. When it comes to choosing a wax shape, if you find the names like ‘Brazilian’ or ‘Hollywood’ confusing (read our guide to bikini wax styles), just ask them to explain precisely which bits will be removed and remember that you can always ask them to tailor the shape to your proclivities. If you’re having a full body massage, your stomach may be included. While many like a stomach massage, it is devisive and your therapist can easily skip it so the same goes here: just ask for what you’d like. Don’t worry about removing your makeup before your facial. A good one should involve a proper cleanse and they can easily remove eye makeup while at it. One golden rule here: do not apologise for your feet. Apparently everyone does it and there’s really no need – you’re there for someone to make your feet more comfortable and pretty. They don’t have to be either of those things when you go in.